Soup is such an easy, weeknight meal that everyone in the family will eat. There's nothing more comforting and homey than soup, salad and bread. But who wants hot soup when we're on our fourth week in a row of 90'-plus weather? Gazpacho is an easy, inexpensive and healthy way to enjoy soup in the summer. I serve it chopped, not pureed smooth, chilled, and with a dollop of sour cream and crunchy bread with butter for dipping. You can pretend it's salsa too, if the kids prefer, and enjoy it with tortilla chips. I served this with grilled chicken pepper kabobs and some of the roasted Eggplant Spread from the previous post. Place all ingredients in food processor. Pour V8 over it and pulse until veggies are smooth but still chunky. Chill before serving or serve straight from the food processor with a dollop of sour cream. Hit it with some hot sauce if you like it with heat. *If you want to save on fat and calories, substitute sour cream for fat-free yogurt. We have a decent sized farm stand near our house and I couldn't pass up the gorgeous eggplants this week. No one else in the house will eat this but me, but hey, I'm one of the four in Feeding Four. I will eat this as a spread for lunch and on grilled chicken or fish. The recipe is modified from one I found in this month's issue of Whole Living magazine. Preheat oven to 400'. Arrange eggplant cut side up on a baking sheet. Make slits in eggplant and insert garlic. Drizzle with 2 Tb oil and sprinkle with 1/2 tsp salt. Bake until tender, about 1 hr. Remove from oven and let cool 20 mins. (Pick out any garlic that go overly crispy and thus bitter.) Place all ingredients in a food processor and pulse until combined. Transfer to a bowl and refrigerate. Serve on crostini or crunchy garlic bread, and grilled fish or chicken. ...shouldn't go to waste. We always have extra tomatoes on hand in the summer, mostly from neighbors and friends who take pity on us since we can't seem to grown them ourselves. And whenever we make corn on the cob, there's usually one or two ears left over. So here's a salad that makes use of both (and the six basil plants I currently have in the garden). Lots of veggie recipes lately, but I promise I'll diversify once I get it out of my system. To take the corn off the cob, place the fat end down on a plate and use a knife to skim it away from the cob, careful not to cut too deep and get the crunchy cob part (or yourself!). I'm serving this tomorrow night with some grilled steaks and baked potatoes for a friend's birthday. Toss corn, tomatoes, onion, garlic and basil together in a medium bowl. Stir in vinegar. Add salt and pepper to taste. Eat immediately or let marinate an hour or so and serve. I've seen recipes for panzanella for several summers now but could never decide if stale bread soggy with vinegar and fresh tomato juices was something I wanted to try. The soak-your-garlic-bread-in-marinara side of me wanted to go for it, but the gags-on-soggy-slimy-things side wasn't sure she wanted to waste a perfectly good loaf of bread. The huge harvest of basil in my garden this summer and my search for recipes using basil made the decision for me. The abundance of delicious fresh tomatoes the next few months make this a great summer choice too. I bought a loaf of olive filone (an olive studded loaf) and took the plunge. I was pleasantly surprised. The bread was more dressed in the vinaigrette than soaked in it and there was something lovely about the contrast between the sweet, fresh tomatoes and basil, the saltiness of the pickled olives and capers, the buttery softness of the bread, and the crunch and heat of the red onion. On a hot day (it's supposed to get to 105' with the heat index around here today) this can't be beat with a glass of chilled white wine or a cold, light beer. Even my husband, who is very much part of the soggy-bread-is-icky camp enjoyed this. I served it with shrimp marinated in Italian dressing. And, in the interest of full disclosure, all we had on hand was Lime Bud Light, so there you go. This would also be tasty with some greens tossed in. If you can't find olive filone (I got mine at the Harris Teeter bakery up the street), don't sweat it. 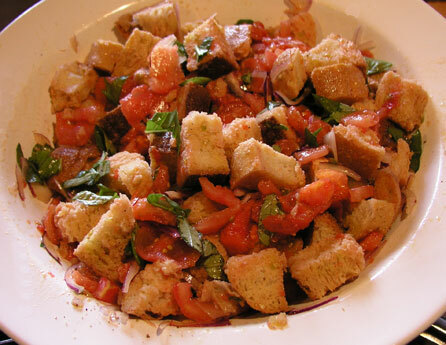 Panzanella works with any crustier bread, like a baguette, especially if it's a day old or more. Disclaimer: We ate this faster than I could get a picture, so the photo above is one off the internet, just for an example. Also, I could not tell you if this is an authentic panzanella, only that it's very tasty and the way we like to eat it. My husband's family is half-Italian and we grew up in a big Irish/Italian area with tons of Italian-immigrant restaurants and food traditions. But I have never had this at a family dinner or eaten at any restaurant that served it, so I have no point of reference but my own taste buds. But the tastebuds, they likey. Also, my four-year-old would not touch this as is but will eat all the components separately, especially if I give him a little olive oil to dip his bread in. We're trying to raise a good Italian/Irish/French/American here. Toss bread, tomatoes, onions, basil, garlic and capers together gently. Sprinkle with vinegar then oil, salt and pepper to taste. Toss gently until everything is lightly coated and seasoned. If you get extra vinegar/oil soup at the bottom, toss it together once more and drain off the excess. If too dry, add a little more of the vinegar 1 tsp at a time. Let sit in the fridge for 10-15 minutes before serving. Toss peach wedges lightly in olive oil and season with salt and pepper. Place on a piece of foil and grill 1-2 minutes each side. Set aside. Season chicken with salt and pepper. Grill until done. Let cool and cut into strips. Wash and chop lettuce and spinach and arrange on two plates. Top with black bean salad, grilled peaches and chicken, and dress with lime vinaigrette. Top with crushed tortilla chips to taste and serve with Newman's Own Lime Vinaigrette. Yet another black bean salad recipe. Seriously though, my mouth starts watering just looking at these. I like the tortillas a little crispy, kind of like a fritata. Drain the black bean salad before topping the eggs so it doesn't get soggy. Using eight eggs gave me enough to make two heaping fritatas with enough left over for the boys to eat plain eggs. Enjoy for breakfast, lunch or dinner. Preheat oven to 400'. Brush tortillas lightly on both sides with oil and bake 5 minutes until slightly golden. Sprinkle each tortilla with 1/4 cup shredded cheddar. Place back in oven for another 5 minutes until toasted. Top with scrambled eggs and 1/4 cup black bean salad and salsa to taste (I used salsa verde). As mentioned in the last post, here is the recipe for my Carolina version of Baja Lime Tilapia with Green Rice. Both are great together when rounded off with chips and salsa (I like the smokey/salty flavor of Pace's Salsa Verde) and All-week-long Black Bean Salad. Tilapia is light and not at all fishy. Even my almost-five-year-old will eat it, especially when prepared this way. I've also included a link to Minute Rice's Website where you can get a $.50 coupon if you don't mind giving a little info. Anything I can do to make my life easier and yours. Preheat oven to 400'. Place the tilapia filets on parchment paper. Sprinkle lightly with sea salt and Old Bay seasoning. Place 2-3 slices of lime on each. Bake in oven for 10-12 minutes or until fish is opaque and firm to the touch but not brown and "crispy-looking" around the edges. Garnish with extra chopped cilantro and fresh lime wedges if you're having company. Serve hot. Meanwhile, toss hot rice with butter and salsa (if desired). Fold in chopped cilantro and stir in lime juice to taste. Add salt and pepper to taste. Serve hot. I love recipes that I can make once and re-use throughout the week over and over again without getting tired of it. This black bean salad is one of those recipes that the whole family loves. I pick out some black beans and mash them for Ben, and Linc eats it as is with any meal. This week, I used /will use this salad as 1.) a side salad for dinner (Baja Lime Tilapia, Black Bean Salad and Green Rice), 2.) as a relish/salsa dip with tortillas for snacking throughout the day, 3.) as part of my Grilled Peaches Southwest Chicken Salad, and 4.) on huevos rancheros this weekend. Yes, that's a heck of a lot of black beans and but they're so lean, tasty (in this recipe anyway) and CHEAP! And it's versatile. If I don't have tomatoes on hand, I'll leave them out. If I'm in the mood to add red peppers, I throw them in. Make the recipe your own. I have. :-) I'll post my (most recent) version of the salad recipe below and then post the above recipes (fish, chicken and eggs) in coming posts. *For a quick, easy dressing, I like to use Newman's Own Light Lime Vinaigrette (click here for the coupon). It does make the salad a little more wet and you'll get better flavor from squeezing in 1-2 small limes (or even substitute 3-4 Tb of red wine vinegar if you don't have limes on hand) and adding a little canola oil (don't use EVOO as it congeals in the fridge), salt, pepper and sugar to taste. But if you want quick and easy--and light!--that N.O. dressing is fantastic. And you can use it on the chicken salad later too. Toss in a bowl; mix gently. Season with salt and pepper to taste. Chill before serving.